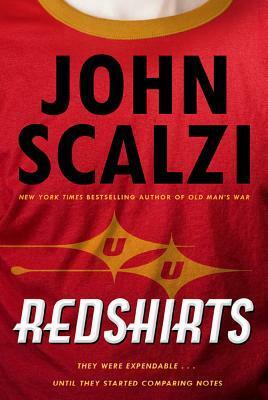 Let me start off by saying that I'm a big fan of Scalzi's OLD MAN'S WAR series. They are fun, witty books that simultaneously pay homage to and question the morality of the kind of military space opera epitomized by Robert Heinlein. Needless to say, I was hoping for more of the same from REDSHIRTS. As much as I'd like to discuss it here, I won't reveal what happens next, because Scalzi is on record as hating unnecessary spoilers. But I will say that it gets very "meta" and self-referential, in the style of tv show COMMUNITY. In many ways, I think your tolerance for this kind of humor, as well as your familiarity and interest in the subject of satire, will determine the degree to which you'll take to REDSHIRTS. People who feel that they are really "in" on the joke are probably going to love this book. Unfortunately, that doesn't necessarily include me. It's a well-crafted book, to be sure, and there were some really funny moments that had me laughing out loud. But I think I have to characterize my own feelings as "like, not love." I found myself wishing that Scalzi had spent more time building up the big reveal, and using some of that extra space to explore the characters and introduce the idiosyncrasies of life on the Intrepid in more subtle fashion. For me, this would have been more effective than the codas in fleshing out the characters and the goofy world they inhabit [Edit: I should probably note here that coda 3 is quite good]. At the end of the day, though, I think my main issue with REDSHIRTS boils down to me just not being all that into "meta" comedy, and though I like STAR TREK, I don't really care enough about it to really feel "in" on the joke. On a personal level, I would have preferred another OMW-style space opera, where Scalzi's humor and wit integrate into what are otherwise serious science fiction stories. That's just me, and you, dear reader, have every right to retort, "well, he just didn't get it." Nerd coefficient: 7/10. "An enjoyable experience, but not without its flaws"